With the Christmas celebrated well all around, its time to welcome the new year, i.e. 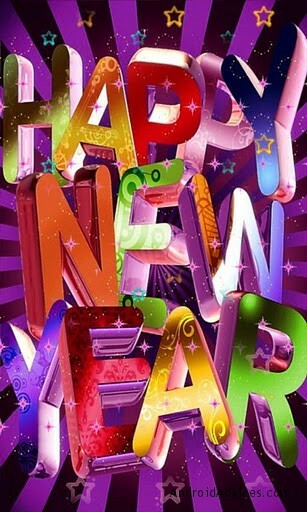 2012 with great excitement and all sorts of fun, resolutions, messages, greetings and a lot more. To make the new year entrance a bit more geeky, it would be the best idea to make the phone look prepared too. Live wallpapers is one of the ways to make the phone feel look better with the interface, and as we did it with the Christmas live wallpapers, the same on New year would be great too. This is a unique and different flashy live wallpaper with different images, most of which give importance to both Christmas and New year, with the options of scrolling, rotation of wallpaper when using in the landscape more, scaling of the pictures, the transition between the images. When you get bored of any one picture, you can have an option to double tap on the picture to shift to any other new picture. The time between the changing of pictures automatically can also be set. We have seen a few comments where using the low-end smartphones couldn’t get it to function well, but with the high-end Android phones, this live wallpaper works pretty well. Download the Happy New Year Live Wallpaper. The pink new year live wallpaper is a very bright and glittering one, with large flashy text reading “Happy New Year” and the size of the text and the background picture can be edited, with the live stars sparkling above the text and most of the things can be customized. You can download the Pink new year live wallpaper. A penguin, full snow in the background and the gift beside the penguin indicating that Santa has given him a gift, and he is waiting for the new year to arrive. The theme of new year and winter goes together with the snow falling down, and the main thing to notice would be the countdown timer which indicates the number of hours left for the new year, and when the actual time would arrive, it shows the number of minutes and seconds too. You can set the format of time to show, between days, hours, minutes, seconds for the time left before entering the year 2012. 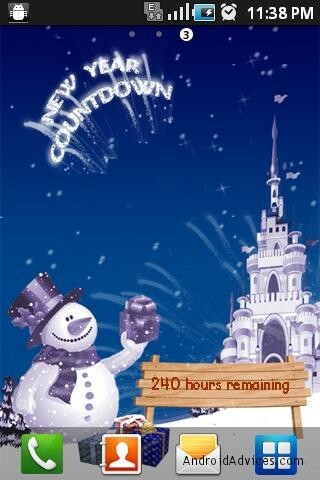 And the color of the countdown timer can also be changed, along with the options of choosing the fonts. 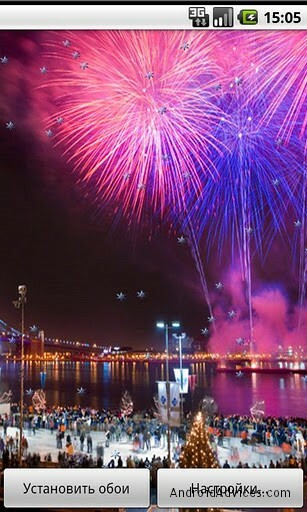 Download the New Year Sky Live Wallpaper. 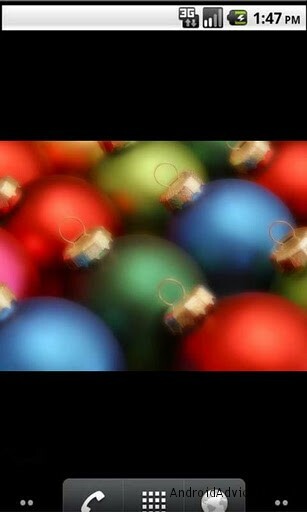 This is a simple and cool live wallpaper similar to the Happy New Year live wallpaper which we shared above. 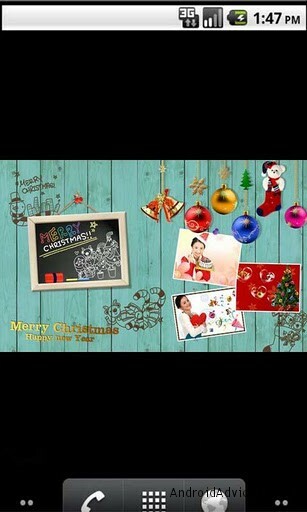 It is for celebrating the Christmas, winter season and New year all at once. 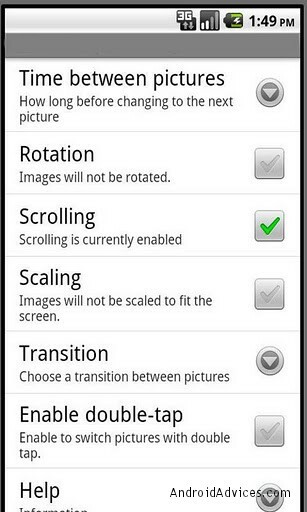 Options are available to change the transition time, picture frames and also scaling the pictures, and automatic conversion of format of the wallpaper when shifted from normal mode to landscape and vice-versa. Download the Cool New Live Wallpaper. Don’t go with the description that has been given in the Android market, as its all about the season Christmas explained there. But the live wallpaper you get there is beautiful, with the firecracker lighting in the sky above the city, which mimics the scene that occurs during the new year celebrations at midnight. 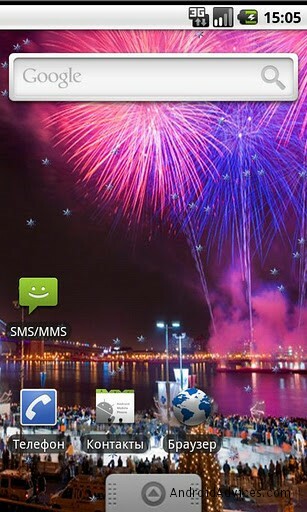 Download the 2012 New Year Live wallpaper.